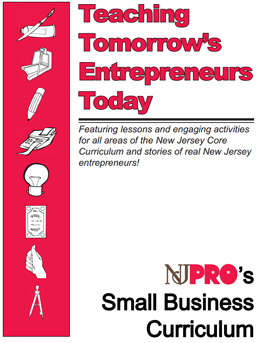 Completed in 2005, NJPRO’s small business curriculum, Teaching Tomorrow’s Entrepreneurs Today provides students with a better understanding of how the academic concepts learned in the classroom are relevant to projects they may face in the workplace. It also educates students on the US free market system and allows them to think as inventors, innovators and entrepreneurs, all while effectively preparing them for a career. The Curriculum is intended for use in middle schools and complies with the NJ Core Curriculum Content Standards, as adopted by the NJ State Board of Education in 2004. While the lessons in the curriculum still help provide the skills that employers say are critical to succeed in any field, the lessons are not aligned with the Common Core State Standards (CCSS) as adopted by the NJ State Board of Education in June of 2010. However, we still encourage you to use the Curriculum and integrate the lessons into day-to-day instruction, so that students are better able to make the connection between what they are learning today and how they will apply it tomorrow. Please feel free to contact us if you have any questions.